Volvo D4-260 motor with just 50 hours on the clock. Professional maintenance with all bills available. 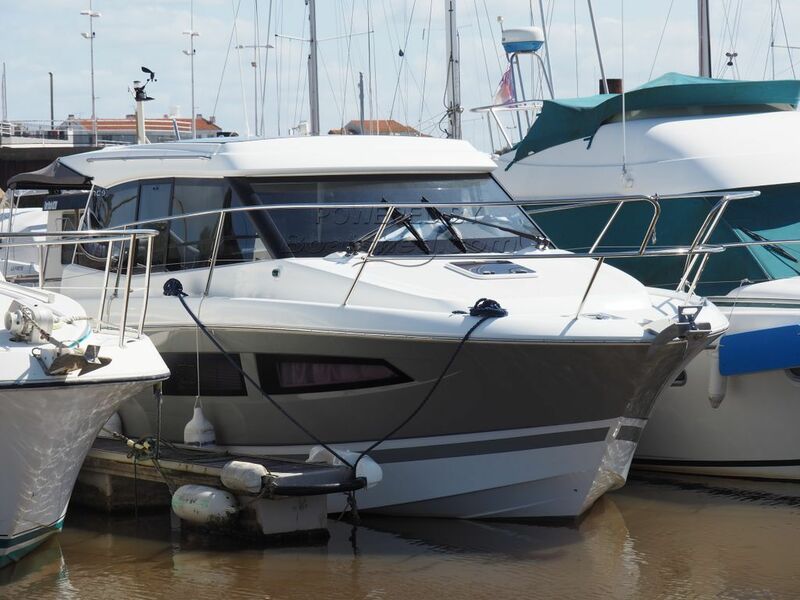 The Jeanneau yard needs no introduction and the NC9 is a very popular model. This particular one is the top of the range "Première" version and has been meticulously maintained for a fastidious owner. Light bright and modern interior with ease of movement and conviviality thanks to the Sedan, all-on-one level conception. Starting forward is the main cabin with double bed followed by the guest cabin with it's double bed 140cm x 180 cm. Heads with electric WC shower & basin. Hot water is from a tank heated by 220v on shore power and the engine via an exchanger whilst cruising. Galley has a double hob a microwave and fridge and good work surfaces. Note this is a gas free vessel. Comfortable helming position and saloon which opens out onto the terrace like aft deck. Cockpit has full canvas covers and a hot & cold water shower. Electric winch which can be operated from the helm. Jeanneau NC9 for sale in France. Boatshed Vendée is pleased to offer this immaculately presented motor cruiser for sale on the French west coast. I was really impressed by the standard of care taken of this boat it is hard to imagine that it is 3 years old. She really does look like new!! For more information and appointments to view please contact Fabrice, your local Boatshed broker at Boatshed Vendée. This Jeanneau NC9 Version Première 2015 has been personally photographed and viewed by Fabrice Guyon of Boatshed Vendee. Click here for contact details. Please note this comments section is public. Please do not post your personal details here. To enquire about purchasing this boat, please contact the broker directly at fabriceguyon@boatshedvendee.com. Please read our commenting guidelines before posting.